It’s the month of March, which means that the Jacksonville area is still pretty chilly by Florida’s standards. As people across our fair city look forward to the not-so-distant time when summer temperatures will return, it’s a great idea to start thinking about what you’d like to do with your backyard this year. We don’t just mean, “plan a cookout” or “go camping in the backyard with the kids” we mean thinking about the kinds of landscaping or hardscaping designs that could breath some new life to your backyard while also adding functionality. C & L Landscape is Jacksonville’s preferred landscaping designer. We’ve helped many different residential and commercial customers come up with design ideas that make their properties really pop. For many residential landscaping customers, this means adding backyard design features like an outdoor kitchen. If you’re interested in making some landscaping design improvements that will expand your living space, add value to your home, and make it easy to cook all kinds of foods without stinking up your house (or making your A/C work double time from all that stove heat! ), you’ll definitely want to read the rest of this post! It’s happened to all of us. We find an exciting new grilling, baking, or stove-top recipe that you want to try. The only problem is that about halfway through the preparation, you realize the ingredients–while delicious–are extremely fragrant. You want to open up doors and windows to let in some fresh air, but it’s the middle of summer! To allow your A/C to escape is unconscionable in the Jacksonville heat. So, you’re resigned to cranking up the exhaust fan in the hood of your stove, and praying that your guests aren’t too grossed out. 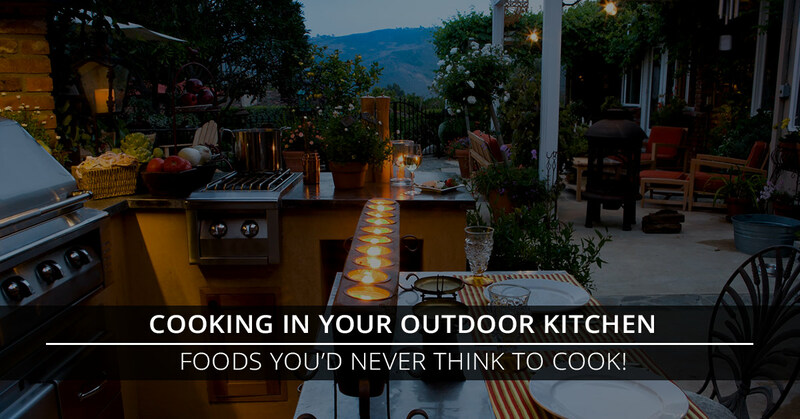 When you have an outdoor kitchen, cooking the following odiferous foods is a joy because you get to combine all the amenities of an indoor kitchen with the open air benefits of cooking outside! Fish – There’s nothing more delicious and healthy than a nice piece of fresh fish. Here in Jacksonville, the opportunities for buying fresh fish abound! When you have a beautiful outdoor kitchen installed by C & L Landscape, you’ll be able to grill, saute, or roast that fish to perfection without the stinky smell. Broccoli – Have you ever put a pot of broccoli on the stove to steam, only to find yourself wondering where that horrendous odor is coming from a few minutes later? Cruciferous vegetables put off a gaseous odor when cooked that can be a real turn off. Avoid it when you steam broccoli on the stove top in your outdoor kitchen! C & L Landscape Is Jacksonville’s Preferred Backyard Kitchen Designer! Check out the examples of hardscaping projects we’ve completed in our online gallery, including several lovely outdoor kitchens and fireplaces. Then contact us for your estimate today!